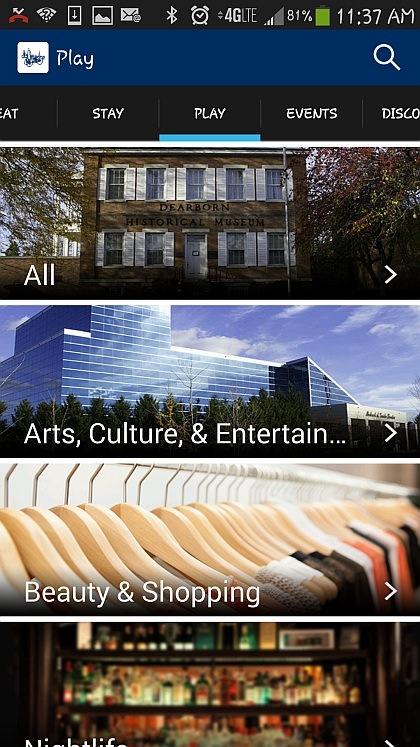 DEARBORN, MI – The Dearborn Area Chamber of Commerce has launched a new, free mobile application to aid residents and visitors to the Dearborn area in discovering the offerings of the community’s businesses and attractions. The app, called “Discover Dearborn,” was launched in partnership with the City of Dearborn, and both the East Dearborn Downtown Development Authority and the West Dearborn Downtown Development Authority. The app will allow residents and visitors to easily identify restaurants, shops, hotels, attractions and other Dearborn area businesses and organizations. Using the categories of Eat, Stay, and Play, app users can find great locations to enjoy a meal, interesting things to see and do, and local hotels by proximity to their location. App users will also find local events and entertainment by using the calendar of events, which includes favorites such as summer concert series, food truck rallies, Dearborn Area Chamber community events, and other events hosted by Dearborn area organizations and the City of Dearborn. The app is currently available for Apple and Android users for free download. For more information, please visit the Dearborn Area Chamber of Commerce online at www.DearbornAreaChamber.org or by phone at 313-584-6100. Be sure to follow the Dearborn Area Chamber of Commerce on Facebook at facebook.com/DearbornAreaChamber, on Twitter @DbnAreaChamber and the Chamber website for all the latest Chamber news and events.